“When are they going to learn …” this is what Ray Parlour, our former player, said that after the Stoke defeat and I feel no one but the team can answer this question and only when they play better. In my opinion not learning from our mistakes has cost us this season. I have not watched the last three Arsenal games and I regret only missing the Man United win. However, watching the highlights of the Stoke game has not been easy as once again we demonstrated our naivety in the basics of football. The second goal that we conceded against Stoke was from open play and does anyone here think that it should have been conceded. If Wenger thinks that conceding such a goal is not a problem then I am afraid we are never going to improve. The numbers of goal doesn’t matter, the manner in which they are conceded matters. And what to say of the goals we have conceded on set pieces. Gibbs ducking at the last moment for the Stoke player to deflect the ball in for the first goal says it all. If Wenger is realizing that we have been naïve and need to correct our way of defending at the end of the season, then I am afraid we deserve where we are. Let’s hope, now that he has spotted the weakness, he corrects it for next season. I hope this is the case because our first priority should be to improve and that can only be done by keeping our best players. Nasri was nothing short of phenomenal in the first half of the season and it will be a great loss if we don’t get him to sign the contract. That’s what I feel about Cesc Fabregas too. I know this hasn’t been his best season but he still has been one of our better players and we need to keep him at all cost. More on this when the time is right. Coming to Nasri, there was news on Arsenal.com where Wenger has said that he will do anything to keep him. I personally feel that Nasri will stay and Wenger will do his best to keep him. However, it would have been so much better had the contract been signed in January. At least we would have avoided so many speculations. With no harm done as yet, we need to settle the contract as early as possible and before Nasri has a change of heart. The other bit was about Bendtner who is looking forward to a talk with Wenger in the summer. There you have it! Bendtner has been linked to a couple of clubs so it will be for the better if we let him go because here at Arsenal, Arsene will always play him on the flanks. At least it will create space for a winger and a new striker because right now Bendtner is occupying two places and not playing well at both positions (and sadly all is not his fault). The more thing that can be deduced from the above statement is that Arshavin, Nasri and Bendtner are all going to stay this summer. If this is the case, Wenger will be having a hard time in keeping Bendtner. Also Arsene Wenger had his usual pre-match press conference on Friday. The injury news ahead of the Aston Villa game looks positive. I am looking forward to Vermaelen’s return. Fabregas and Nasri may also be involved. Apart from this, Wenger also said that he will look to strengthen the squad in every position. I know it sounds more like ‘I won’t be buying’ but let’s hope this isn’t the case and we do get the players we need. Tomorrow we play against Aston Villa. Where we want to finish this season depends on how we play against them. We need at least four points from the last two games to finish above City and in third spot. Seeing the last three games, I don’t know what to expect from the team. Anything is possible. Maybe seeing Vermaelen return will put some extra energy into the players. And it won’t do any harm in finishing the season with a couple of wins. I hope we get a good game to witness and we win. And as I was writing this, Man United have won the EPL title by drawing at Blackburn. Good for them and well done!! The joy of wining last night was out of this world; it was an amazing feeling as we did what most have failed to do, beating Barcelona at their game. The belief, determination, spirit, effort and brilliant team work were the key to this result. We never looked awed by their good play and possession in the first half and continued with our game plan in the second half which eventually worked in our favor. While Barcelona were mesmerizing as usual, we weren’t behind. We defended, we pressed, we passed, we created and we finally scored. The defence was amazing as they bravely played a high line and played the offside trap really well. Once we were caught up which led to a goal but you can expect that with Barcelona playing so well. Overall it was a phenomenal performance. Szczesny (8.5): Confident and brilliant as he made a couple of excellent saves that kept us in the game. His decision making along with distribution was excellent. Cannot be faulted for the goal. Eboue (7): Defensively did well throughout the match. Upfront wasn’t that good in the first half as he was losing the ball very cheaply and falling over time and again. Improved his game in the second half and made some good runs. Koscielny (9.5): He was just magnificent. He was strong, quick and intelligent in his play. Made his usual important interceptions and tackles and I don’t remember he did anything wrong. Didn’t give space to any of the Barcelona players. Was early to every ball and covered up well for Clichy and Djourou. Simply phenomenal!! Djourou (7.5): He too was excellent but made some errors by misplacing some of his passes but thankfully we weren’t punished for it. Otherwise he was solid and partnered well with Koscielny. Covered up well for Eboue. Clichy: He was decent at the back but the Barcelona players exploited his flank throughout match. Was caught on the wrong side of the offside-line as Villa scored the opener. Made some important interceptions in the second half as he did well to cope with the situation. His pass to Van Persie that led to the equalizer was perfect. Wilshere (9.5): Wilshere has certainly grown in the last couple of weeks. Last Night he was magnificently outstanding (if it makes sense). The way he dueled in the middle of the park with Xavi, Iniesta and Busquets was amazing. He didn’t look intimidated by any of them as he played his game, looked confident, showed good work rate and linked up the play brilliantly. He also did well in breaking the play of Barcelona. Fabregas (7.5): He wasn’t at his best yesterday yet he produced some amazing balls. His through ball that led to the second goal and his pass to Van Persie in the opening minutes was a delight to watch. Combined really well with Wilshere, Nasri and Van Persie. Song (7): He got booked early on in the game but still didn’t stay back and played his game. His work rate was good as he broke up Barcelona’s play many times and distributed the ball around nicely. Walcott (7.5): A continuous threat on the right as Barcelona players would always surround him whenever he would get the ball. Van Persie (8.5): That goal he scored was one of its kinds. Forget that he missed a couple of good chances as he got the goal at the right time which matters the most. His movement was excellent and did his defensive duties well. Nasri (8): His start was slow as he was returning from injury. Yet he was a threat and in the second half he was excellent. The way he coolly created the goal for Arshavin was impressive. His passing and movement was excellent and did his part in defense by helping Clichy on the right flank. Arshavin (8): He is getting back to his best as he made that goal look so simple. Looked confident and helped in defending when required. He made a mistake near the end but again thankfully we weren’t punished for it. Bendtner (7): Did his job and looked good. He just needs to be quick in making his decisions. To conclude, the whole team deserves a standing ovation for their efforts. And let’s continue with what we did last night in all the other competitions we are in. The second leg can wait for now….just enjoy this moment!! After a hard fought victory against Huddersfield Town just two days back, we are back in action tonight at the Emirates against Everton. Everton are enjoying a very decent spell at the moment and after holding Chelsea to a draw at the weekend, they will certainly be looking for at least a point tonight. Last season they gave us a very hard time in this fixture and only Rosicky’s goal in injury time got us a point. So expect a very difficult game. As for us, we have given some very dominating and some very frustrating performances in the past few games. If we are to get the maximum points tonight and keep pace with United at the top, we will need another dominating performance from our team. As for the starting eleven, I am expecting only Koscielny and Arshavin to keep their places from the last game. Szczesny will return in goal as well as Djourou at the centre back position. On the flanks we will see our best fullbacks, Sagna and Clichy, to return as tonight we cannot take risks. In the middle too, our most lethal trio of Fabregas, Wilshere and Song will be back. As for the forwards, with Nasri out, I would prefer Arsahvin to start in his place with Van Persie and Walcott completing the team. Probable starting XI: Szczesny, Sagna, Djourou, Koscielny, Clichy, Song, Fabregas, Wilshere, Walcott, RVP,Arshavin. As for the game, I have said before that it won’t be easy, so we will need the right attitude from the start. Possession will be vital along with finishing our chances. 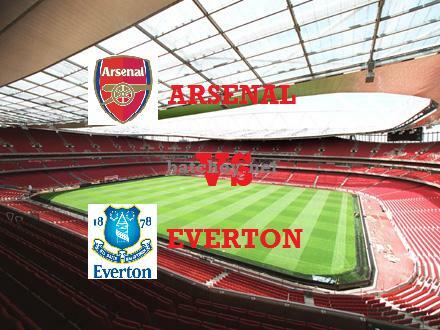 We will need to make sure that we aren’t caught on the counter as Everton are very good at it. An early goal for us will make the game easier. However, if they score first, things will become more difficult. Considering the fact that our first team will be starting, I am expecting a win but still we will need a top performance from them as we cannot drop more points in the Premier League. Another three goals plus a clean sheet will be amazing but I will be content with a win no matter how we get it. And I hope no one else gets injured. Keep your fingers crossed!! This game will be exciting to the very end.